Results: Staff compiled a priority list of fktures deemed eligible for replacement/shielding based on past light management requests, disorientation reports, and lighting inspections. 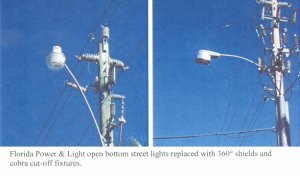 Florida Power & Light grid coordinates were recorded, and the number and style of fixtures were also documented. Fixture retro-fits were made along four Keys in Sarasota County: Lido, Siesta, Casey and Manasda. Twenty-seven (27) fixtures were documented as being directly visible h m the beach and contributing to localized sky-glow. Due to their proximity of the nesting beach they all required 360' shields. Of those, nineteen (1 9) had to be replaced h m open-bottom, directional or drop-globe fixtures to full cut-off cobra head fmturcs.